I had a duck visit for Easter. My dear friend, author Cathleen Ross, came to visit bringing her wounded Mallard. Duck Duck (unimaginative name for a writer’s duck, I know, but it kind of suits him) had been mauled by Cathleen’s pet rabbit Poppy and couldn’t be left at home. Poppy was the cuddliest, sweetest little girl bunny that suddenly morphed into a scary, testosterone-fuelled male (okay, so he was always a he but Cathleen didn’t know that). Poor Duck Duck somehow got in Poppy’s way and arrived at our place sporting a bandage around his almost de-feathered neck. Duck Duck was the most amazing house guest. Shy at first, he didn’t stray too far from the back porch and familiar people. But by day two he came out for a walk with us, right down to one of the big ponds (or small dams, depending where you live in the world) at the bottom of our property. I couldn’t believe the way he waddled so confidently along behind dog Molly. The wild ducks on the pond took off when we got there, but that didn’t stop city dweller Duck Duck from splashing around. 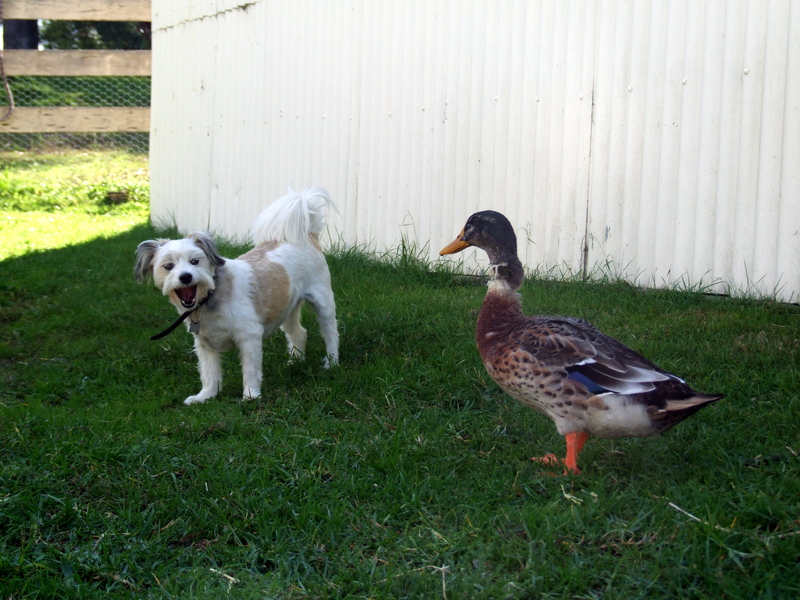 By day three both duck and dog were rushing to the gate to greet visitors. 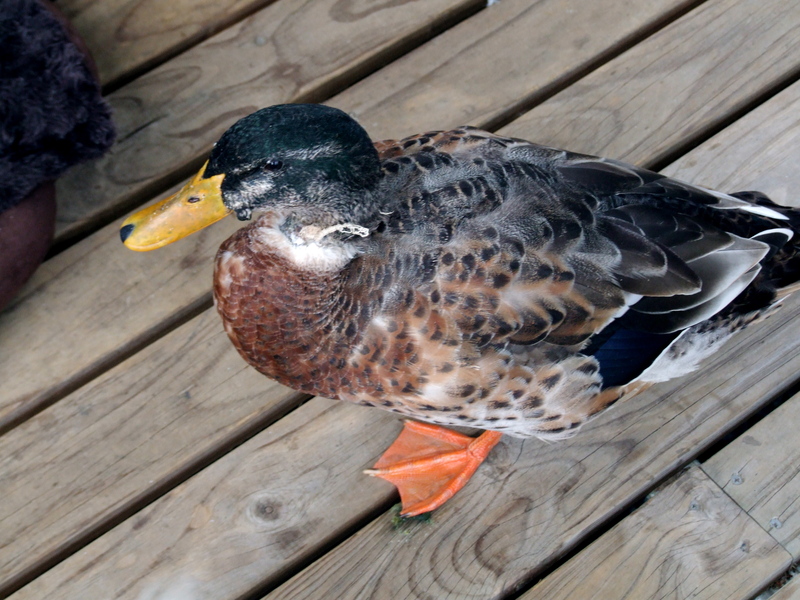 He quacked and waggled his tail when I spoke to him and I fell in love. I want a Duck Duck of my own. What I’m reading: The Lollipop Shoes by Joanne Harris. This is the sequel to Chocolat a favorite book and a favorite movie. It takes up the story of Vianne and her daughter Anouk and has the same quirky mix of magic, menace and chocolate. I’m loving it and of course can’t “see” the characters as anything other than Juliette Binoche and Johnny Depp. This entry was posted in Animals and tagged Mallard duck, The Lollipop Shoes by Kandy Shepherd. Bookmark the permalink.